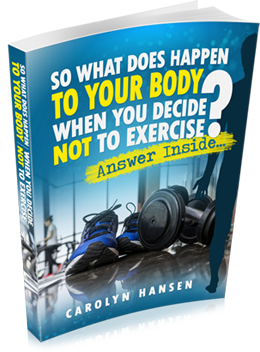 FREE EBOOK - Are You Kinda Curious About What Happens If You Choose NOT To Exercise? Not everyone is curious about this, that's for sure. Sure - 400 million people WILL die in the next decade from diseases almost all of which will be premature, agonizingly painful, and ENTIRELY preventable. But none of this should matter a jot to you. Unless you don't want to BE one of the 400 million who actually had a chance to avert their fate and blew it. Use exercise to stall "shutdown mode" - your body's TRIGGER for rapid aging! I NEVER share your info with others. Entering your email adds you to my newsletter, from which you can unsubscribe using a link in every email I send. Hey there, my name is Carolyn Hansen, and as a personal fitness trainer I can tell you that the biggest reason people fail to reach their fitness goals is that they stop coming to the gym. If you've stopped yourself you know just how easy it can happen, and how HARD it is to get restarted. Well, what if you didn't have to go back to the gym to finally get into the best shape of your life? What if there was a SINGLE piece of fitness equipment that could make your fitness challenges disappear? Is versatile (works your entire body) and yet costs less than most gyms charge for a single month of membership fees! This may very well be the FASTEST possible way for you to get into shape and remain that way. Not only that, but you'll be able do it while expending effort for as little as an hour each week (possibly even less). Finally you can forget about having to come to the gym to get into shape. Nor do you need to pay for a personal trainer to put you through your paces. Once you start sandbag training in the privacy of your own home (or anywhere else for that matter) you'll discover that this no-fuss alternative approach to working out has slowly but surely begun to completely change the way you think about staying fit, healthy, and energetic. Attain and maintain peak fitness levels, while training no more than two or three times a week! And the BEST part of all? 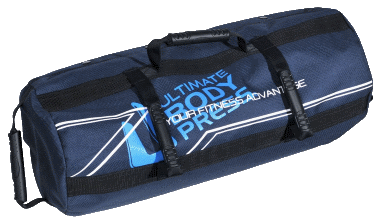 It's that by putting a sandbag into your workout you automatically get to take advantage of ALL the benefits that come from FULL BODY workouts. No more thinking about which body parts to exercise today, or how to rotate in the exercises you've allocated for those particular limbs and muscles. Because the full body workout does exactly what the name suggests - it exercises your entire body at the same time! This is the reason you can squeeze a SHORT workout into your busy schedule (with sessions as short as 15 minutes) and still manage to hit nearly every muscle in your body. So Effective You Could Train A Gladiator With This System! 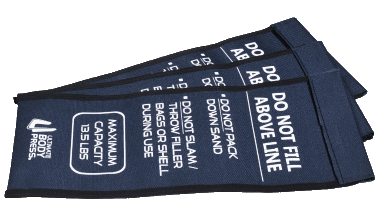 If you're still not entirely sure that a sandbag would be able to provide the level of efficiency and power required to whip your body into the best state of fitness you've ever experienced, here's something for you to think about. Ancient societies like the warring Romans swore by the full body workout. They used it to prepare and toughen their soldiers for the extreme physical challenges of combat. It's proven to be effective for more than 2,000 years! If there's a more convenient way to get the job done, a more convenient piece of equipment to both use AND store in your home, I've not come across it in all my years as a trainer. 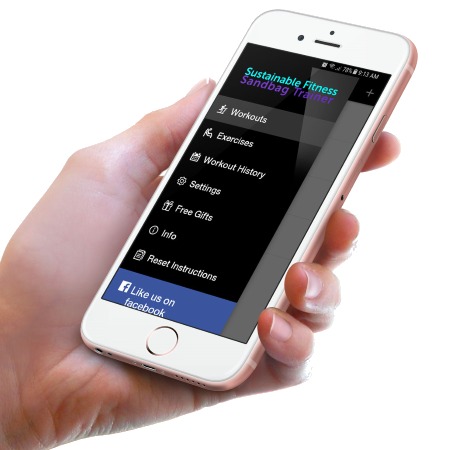 What's more, to help you get the best from your sandbag workouts I created an app that provides you with workout videos any time of the day so that you'll always know exactly how to perform only those movements that provide the biggest bang for your buck. Look, short of putting an oversized Olympic weight lifting bar into your garage, stacking it with plates, and powering through a session of deadlift moves every few days, this alternative approach to keeping your body in top shape is unmatched in its effectiveness. Plus once you're done with the equipment you can toss it under the bed, out of sight, until the next time you need it. If you'd like to receive a FREE ebook about the consequences of FAILING to exercise for an extended period of time you can go now to my download page for my book: "So What Does Happen To Your Body When You Decide Not To Exercise?" You'll learn all about what it takes to ensure you never suffer the consequences of trying to find out the answer to the question posed by the book by simply sitting back and doing nothing. Because I guarantee, you'd not like the results!